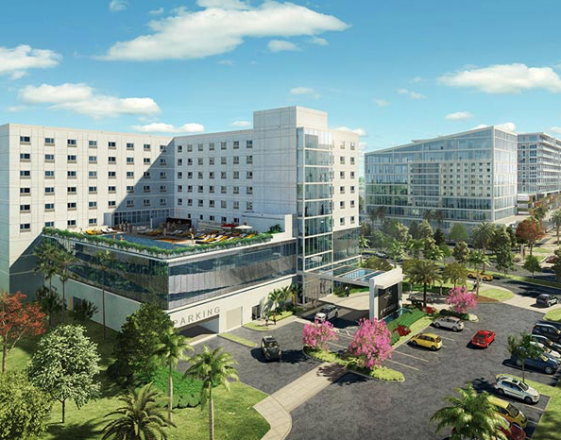 Savvy travelers seeking a stylish and functional hotel in an urban setting, will delight in the new design-led, boutique-style AC Hotel Miami Aventura by Marriott® opening in mid-May. The new 233-room property is located at 20805 Biscayne Boulevard, Aventura, just minutes from the Aventura Mall and Gulfstream Park. AC Hotels by Marriott embody a cosmopolitan and dynamic style with an intrinsic connection to the community in which it is located. Each property is built from scratch and designed with the 21st century traveler in mind, defining a new way of traveling. Managed by Pyramid Hotel Group, the sophisticated, contemporary hotel will cater to the creativity and passions of stylish travelers with a millennial mindset. The AC Hotel Miami Aventura melds distinctive architectures and chic interior design elements with competitive pricing for a large and growing demographic of creative entrepreneurs who are constantly on the go. The AC Hotel Miami Aventura offers 233 rooms and a variety of amenities. The rooms are designed to be spacious and functional to serve the purpose of the traveler. The rooms feature a free mini bar, a special AC bed with four pillows and a reading lamp, free Wi-Fi, a work desk, 24-hour room service, laundry service and other exclusive supplements. The AC Lounge features co-working space by day and transforms into a hub of social buzz by night with signature cocktails and light bites. The Lounge features a reading area with newspapers, magazines and local guides, a multi media area with comfortable sofas and a 52” television, and free Wi-Fi. The AC Kitchen provides breakfast delights including European-style artisan sliced meats and cheeses, yogurts and savory egg tarts, as well as and Nespresso hot and iced coffee throughout the day. The breakfast is a complete buffet with a wide variety of freshly baked pastries, tasty delicacies and fruit juice. The property also features 2,200 square feet of high-tech, flexible meeting space, designed for groups ranging from 4 to 50; a rooftop pool and patio with stunning views and ample space for events and fitness classes; and a health and fitness area that overlooks the sun-drenched pool deck. All AC Hotels feature free fitness centers with the latest equipment, wall bars, towels, water, televisions and music.